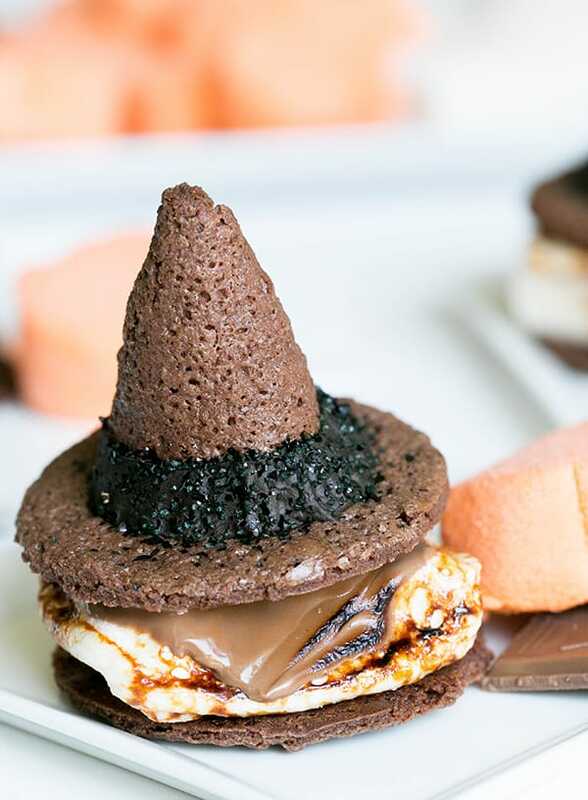 If you’re hosting a Halloween night and you’ll be making some treats, these witch hat s’mores will really add some charm to the party!! It’s just a thin chocolate chip cookie that we molded to resemble a traditional witch hat and they are pretty adorable, if I do say so! 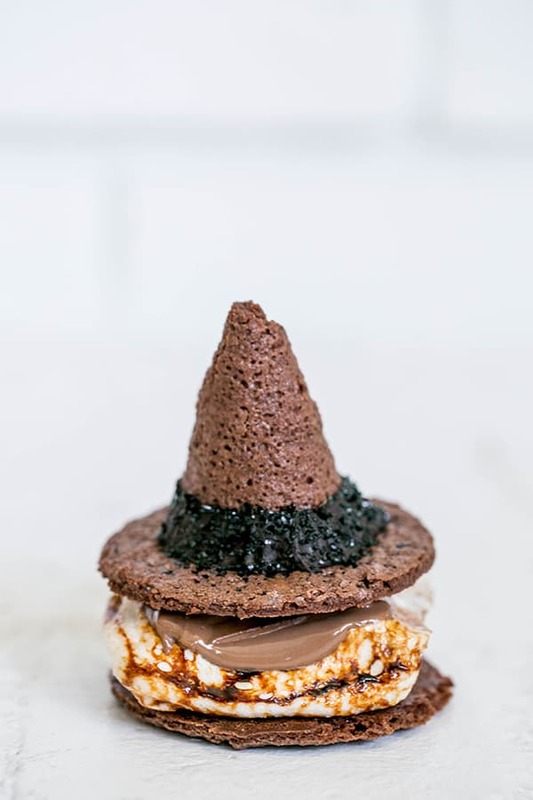 The witch hat s’mores also look sweet on a platter and you know adults kids will go crazy for them! ; ) It took us a few tries to get the hat rolling part down when making them, but after the first two, we were pros and they started looking better! After assembling these Halloween cuties, we piped some dark chocolate frosting around the hat and added black edible glitter! See the how too below! You’ll also need biscuit cutters, cookie sheets, parchment paper, petal piping tip and bag, black sprinkles, chocolate frosting. Preheat the oven to 400 degrees. Mix egg whites and sugar in an electric mixer, fitted with the paddle attachment. Add in the cocoa, flour and salt. Then add in the melted butter, vanilla and cream and mix until everything is combined. Place parchment paper out on a cookie sheet and scoop the cookie mix onto the parchment paper. Spread dough around until it’s thin, around 1/8 inch thick and at least 3 1/2 inches wide. They don’t have to be perfect circles because we used a biscuit cutter after to get an exact circle. Bake the cookies for 6 to 7 minutes. 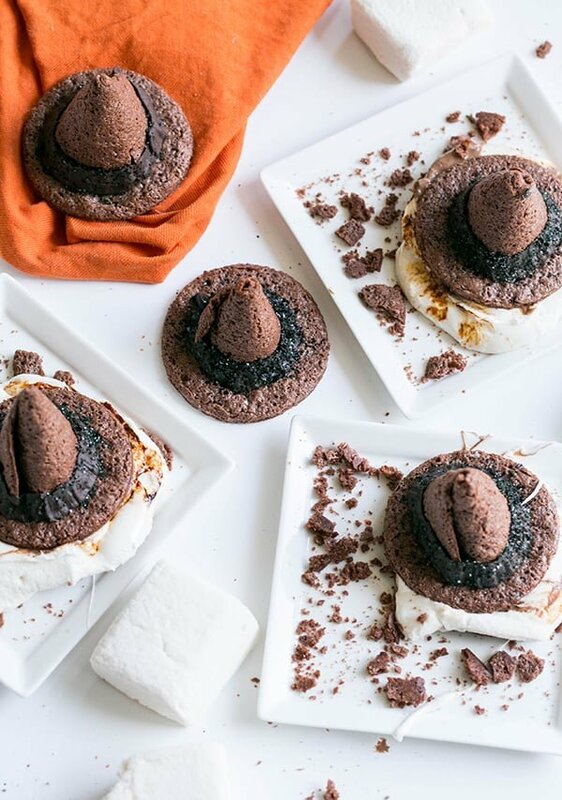 As soon as you pull them out of the oven, use two different biscuit cutters (2 3/4 inch circle and a 3 1/4 inch circle) you’ll make two 2 3/4 circles (one for the top of the hat and one for the bottom of the s’more) and then cut a 3 1/4″ circle to make the cone. While the larger circle cookie is still hot, cut 1/4 of the cookie out like a slice of pie. Then roll the cookie like a cone before it cools. This has to be done pretty quickly, so only make a few of these at a time. When it has it’s shape, let it cool completely. Once you’re finished you’ll have about 16 2 3/4 circles and 8 cones for your hats. Use dark chocolate frosting on the bottom of the cone to stick to the round circle. Then using a petal tip, pipe it around the edge. Add some black edible glitter or sprinkles! Cool Down With these Roasted Blueberry Crème fraîche Popsicles! 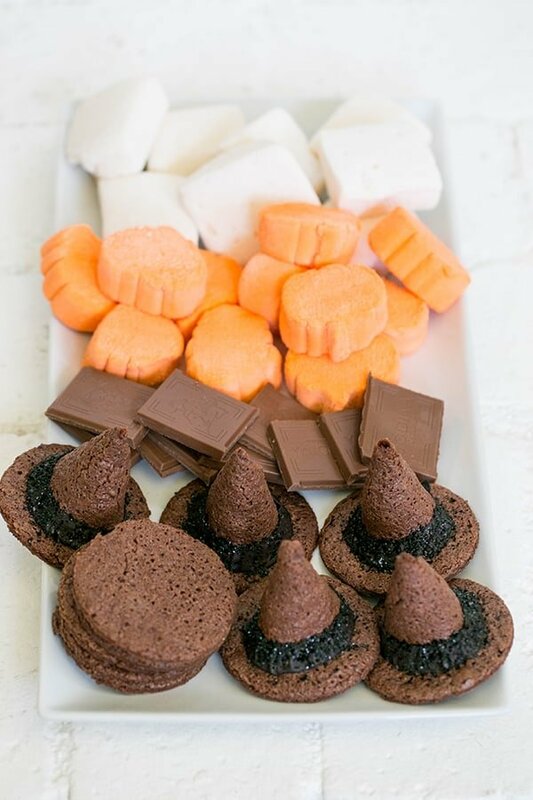 I absolutely love this idea and most just because it combines my love of smores with my love of Halloween! So clever! Thank you Haley!!! They were fun to make… a little challenging at first but once I got the hang of it, it was easy! !